The seeds are effectively applied to induce urination and relieve urinary infections and irritations such as scalding urine. Watermelon seed is known to strengthen kidney function. Is diuretic and anti-inflammatory. The herb is also known to treat fevers. Watermelon seed is very beneficial for your body. The presence of Omega 6 and Omega 9 essential fatty acids helps the skin immensely. 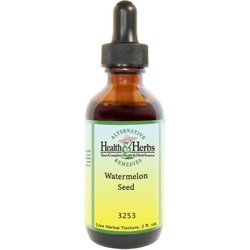 Watermelon seed does not clog pores or prevent the body from naturally eliminating toxins through the skin and it is a great choice for use with oily skin but can be effective with all skin types. Water Melon seed is added to skin care formulations for all skin types, including dry, oily, acne-prone or maturing skin as it is rich in essential fatty acids, which help to restore elasticity. Ingredients: Watermelon Seed, Structured Water, 20% Alcohol. Non-Alcohol: Watermelon Seed, Structured Water, Vegetable Glycerin. Contraindications: People, suffering from coldness or dampness, or both conditions, should not eat or take watermelon as medicine. As of this writing, there are no known drug interactions associated with watermelon. From Anonymous of Honolulu, Hawaii on 6/25/2012 .